I’ve said it many times before, and I’ll say it again: Japan is not like any other place in the world. And this is no more evident than in the dining culture of Tokyo. 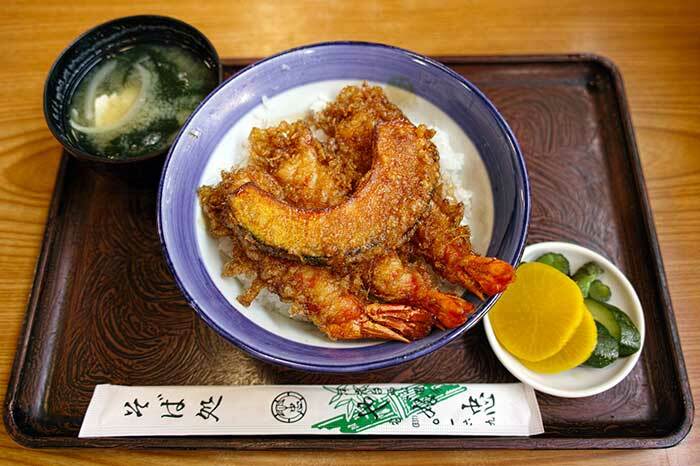 Below are 6 unique dining experiences you must try when visiting Japan. It goes without saying that I had to eat sushi in Japan, but I absolutely had to try Kaitenzushi, or “conveyor belt sushi”. This type of service is fairly common outside of Japan. I’ve certainly eaten my fair share at places like Blue C Sushi in the U.S. and Sushi King in Malaysia. In Japan, conveyor belt sushi is considered a second citizen to sushi you can get at a sushi bar. It’s considered not as fresh and made with second-rate fish. But I didn’t find this to be the case when I visited a kaitenzushi restaurant in Harajuku because this restaurant had solved the freshness problem. How, you ask? In front of each seat is a tablet from which you order. There are also menus so that you can see the full menu and prices. 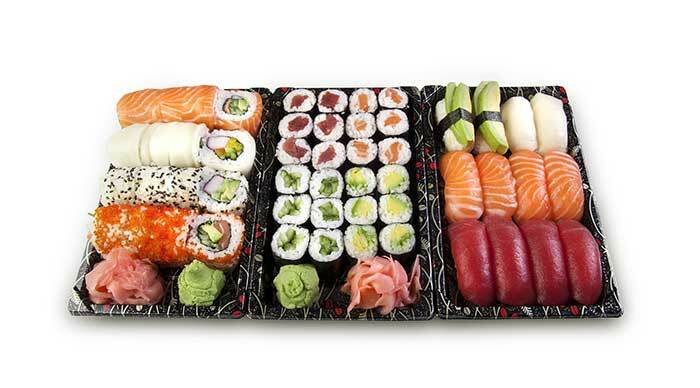 Once you submit your order on the tablet, simply sit back and wait for your sushi to come out on the conveyor belt. I was amazed by how quickly the food came out. Before long, the tablet in front of me would flash, indicating that food was on its way, and whether it would be on the top belt or the bottom belt. After taking the plate off the belt, simply tap the tablet to confirm that you received the plate and the empty tray is whisked back into the kitchen, ready to receive the next order. It was so much fun – I kept ordering just to watch the food coming out. And the sushi is affordable too. 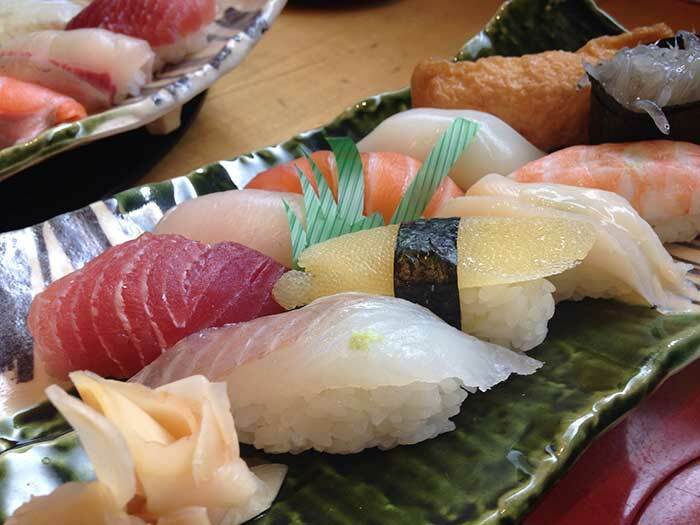 Many places offer an extensive 100 yen sushi menu. To me, kaitenzushi is the perfect amalgamation of futuristic Japan with ancient Japan. On any given street, you can find a huge shopping mall or office building with small restaurants tucked in the building’s basement. Old alleys with tiny restaurants, no more than a stove and a counter, called yakocho, are stuffed next to crowded crosswalks. If you are looking for a quick, cheap meal, you’ll probably find it at a standing restaurant. The first time we went to one, we were a little surprised – where are the seats? But we soon realized that there were intentionally no seats. These restaurants are designed for customers to come in, eat and leave – not sit around and take up space without ordering. It may seem weird to eat standing (after all, it’s the opposite of what our parents taught us), but think of it this way – it’s just like dining at the chef’s table. Japan has developed a lot of procedures to improve efficiency, and one of these is ordering by vending machine. The process is simple: put your money in, push the button corresponding to what you want to eat, and give the printed ticket directly to the chef. Any change is given directly from the machine. The entire operation is quick and clean, and offers no room for discrepancy. Most of the vending machines are only in Japanese, so it may take some deciphering. Teppanyaki is misrepresented outside of Japan. Most people’s experience with teppanyaki is somewhat kitschy: a chef in a big tall hat cooks in front of you, flipping eggs and stacking up flaming onion rings. In Japan, the tables are turned and the fun is at your hands. The most common dishes cooked on a teppanyaki grill are okonomiyaki, monjayaki and yakisoba. (See a theme? Yaki means grilled in Japanese). 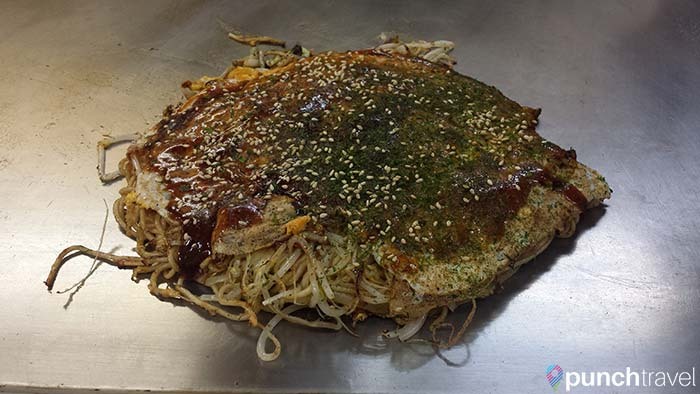 Okonomiyaki and monjayaki are two types of cabbage pancakes, with your choice of toppings (usually pork or seafood). Yakisoba is stir-fried noodles. You’ll be seated at a table with a hot grilling plate in front of you. It’s a lawsuit waiting to happen – probably why you don’t see these in the U.S. Your order will be brought to you in a bowl of raw ingredients and then it’s up to you to cook the dish. The first time we tried teppanyaki, the waitress showed us how to cook it. But after a few tries, it is easy to get the hang of it. It can be smelly, it can be messy, but it’s all part of the experience of teppanyaki. Don’t knock it till you try it, but convenience store food in Japan is actually really good. There are a lot of convenience store brands in Japan: 7-Eleven, Lawson’s, and Sunkus to name a few. 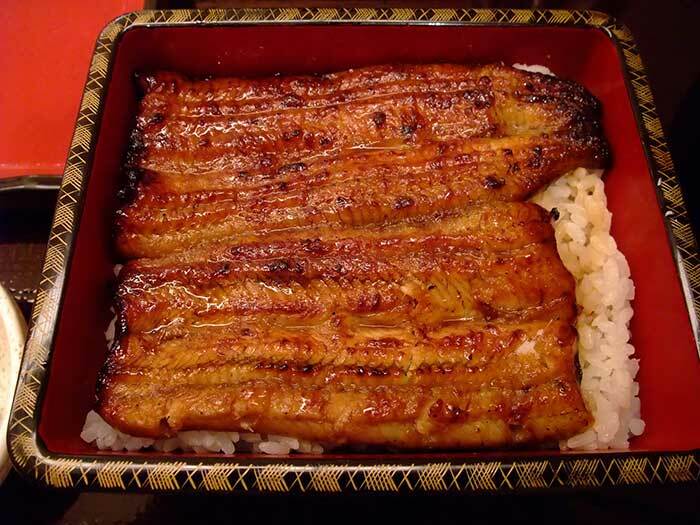 And they all serve freshly prepared bento boxes, sushi, and noodles that are delicious. Upgrade your search to the supermarket for an even wider selection of prepared foods. Plus, at 6pm an amazing thing happens. 20% off, 30% off and sometimes even more! We’ve gotten 8 pieces of red tuna sushi for 450 yen (about $4 USD). You can eat like a king for very cheap. I love noodles in Japan, especially ramen. I am not talking about the dry instant ramen noodles you grew up with with MSG sprinkled on top. I am talking about chewy noodles soaked in a rich, pork bone broth, topped with a gooey soft boiled egg and slices of tender roast pork. It’s enough to convert even the strictest of vegetarians. 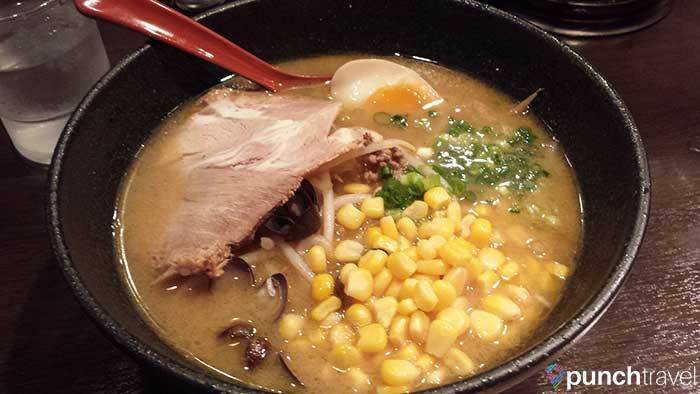 In my opinion, ramen is not ramen by definition without the bone broth that makes it so delicious. However, if you are adamant to maintain your vegetarianism, you can find a pretty good vegetarian ramen at Soranoiro in Tokyo. It can be disconcerting the first time you sit down to eat noodles and hear a very loud SLUUUURP coming from the other patrons. But don’t be disgusted. In Japan, slurping is actually a way of showing appreciation for the food. The louder you slurp, the more satisfied you are! So when you try ramen noodles in Japan, don’t be surprised if your meal is interrupted by a chorus of slurps. 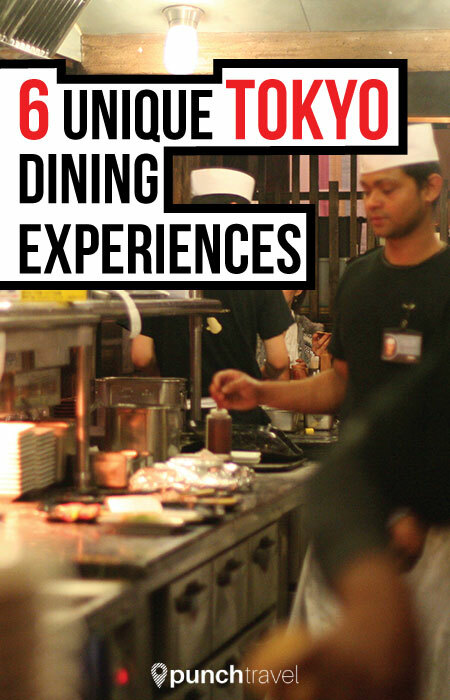 What are your favorite Tokyo dining experiences? Let us know in the comments!